PACE financing is a program that allows a homeowner to pay for energy efficiency or renewable energy improvements to their home with no upfront or out of pocket costs. 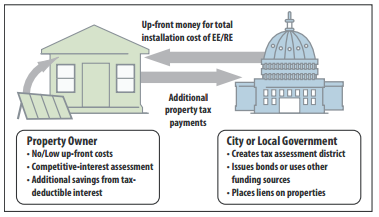 Approved energy efficiency projects, including photovoltaic home solar power systems, are fully funded by municipal bonds issued through states, cities, or finance companies. The cost of the improvements are then attached to a property tax assessment and repaid over a period of up to 20 years. One of the really attractive considerations of the PACE program is that the loan is attached to the property rather than an individual; freeing up a homeowners cash, saving money on monthly energy bills, increasing property value and showing a net gain year after year. The PACE program is also applicable to solar leases and PPA’s, two of the most popular and easily obtained options used to go solar. Why haven’t I heard of PACE before? The PACE program, while not a new player in the solar energy financing arena, has been on a forced hiatus in the residential market. During this time PACE has proven its value in the commercial energy efficiency markets.